The task of understanding and defining business processes is not a new concept. Business Process Analysis (BPA), which has been around for quite some time, used to be considered as simply analyzing an organization’s current processes and designing a concept of it through a modeling tool. The goal of this concept was to deliver a working model of the necessary features for the benefit of IT personnel, since IT was where the proper system was created, tested and implemented to automate these processes. In recent years, this predominate IT focus of BPA has shifted to encompass the business user’s broader understanding and perspective of the overall business. For enterprise architecture, and particularly business architecture, there is a clear need to document business processes, but at a higher level to capture multiple, end-to-end processes and value chains in order to see across the enterprise. At the other end, closer to the application, some of the modeling tools are designed to drive process execution directly—going from model to execution without the traditional need for the manual creation of computer code. This type is largely associated with Business Process Management Systems (BPMSs)—an integrated set of capabilities that help to achieve business performance improvement. The need for better business insight comes from several factors. A primary need has always been to define the automated business process in a way that actually meets the direct needs of the business user—even when he or she may not know how to state what he or she wants. Gathering the right information to ensure user satisfaction has been a traditional problem for business process analysts. There is a growing realization that involving business users fully in process modeling can raise their awareness of what is needed, which will result in better specifications of what to build. We call this new BPA approach, which is oriented to users’ comprehension and understanding, ‘BPA for the masses.’ The goal is to make BPA useful to a much broader segment of people—with the results of much better modeling and applications. Cincom Smalltalk is meeting the needs of business users by using this “BPA for the masses” concept. 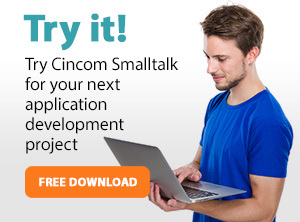 Cincom Smalltalk helps its users get a detailed, structured overview of their entire business not just a simplistic, high-level view of their most basic processes. We help our customers by first understanding their terminology as it relates to their inventory. Then through an interview process, we help them to understand their businesses in a comprehensive way, making checklists and priorities. Once this is complete, we teach them how to simply model their processes to gain a better vision of their overall business structure so they can then hand that model to their engineers who map it to their IT infrastructures. See a working demonstration of how ObjectStudio is used to evaluate business processes in creating a new business. See how ObjectStudio is used to evaluate legacy business processes in an existing business and integrate them with new ones.